Task lighting aids in the performance of the task in the room. A good example would be under cabinet lighting. 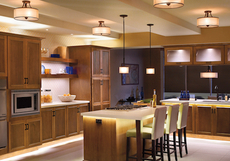 Accent lighting is like the jewelry, the “bling” that aesthetically finishes the room. For example, wall sconces with low wattage bulbs enhancing the design of the fixture.